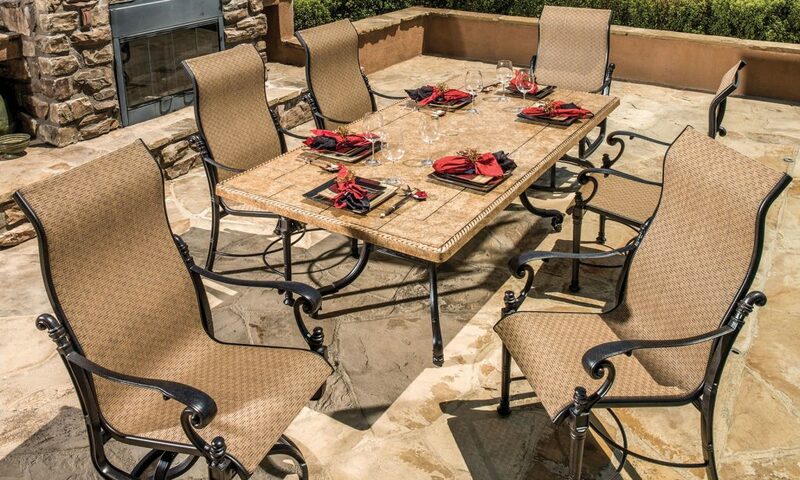 Patio furniture is a must-have in the desert, particularly in the Winter. Wouldn’t you agree? Imagine sitting in your backyard every evening enjoying a sunset full of the brightest shades of pink, purple and orange. That never gets old! You are in luck today because Outdoor Living Concepts has everything you need to design a unique retreat to help you, your family and friends enjoy the outdoors. Granted, not all patio furniture will endure years of blazing Summer heat. This is why we’ve selected the most comfortable, durable and stylish patio furniture we could find. We can definitely help you choose the style of patio furniture that best fits your space, matches your home, and suits your personality. In the end, you may even decide to blend together a few different styles and types of furniture or simply swap out accent pieces to get just the right look you desire. You’ll see why in a second. Can you envision what your ideal outdoor space would look like? Dare to dream it and let the Outdoor Living Concepts team help you make it a reality. Designing your outdoor living space can be a really fun project to take on! And visiting our Palm Desert showroom will help you open your eyes to all the possibilities. Unlike patio furniture purchased at big-box stores, at Outdoor Living Concepts you can customize your furnishings to best fit your space. Need an extra lounge chair or two sofas instead of one? No problem. Your customization options are endless. You can choose any combination of sofas, love seats, sectionals, club chairs, rockers, chaises, double chaises, end tables, coffee tables, ottomans, high tables, bar stools, dinning chairs, dinning tables of all shapes and sizes, and more. This collection was inspired from mid-century designs. Featuring flowing lines and smooth elegance, each piece of patio furniture in the collection is a marriage of elegance and comfort. A variety of options are available with the contemporary style of the Phoenix collection as it offers the ideal foundation for any outdoor living space. 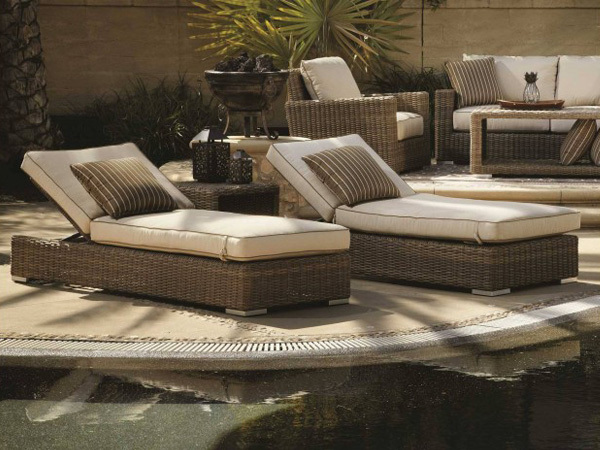 This set of patio furniture is an effortless expression of precise sculpting work. With a streamlined design, the Amari Collection flows together with any outdoor patio features as it includes a cast iron frame reminiscent of mid-century styles. There is a light and airy feeling to the Amari Collection giving it a tranquil appeal in many environments. Ready for rain, this patio furniture fits any need as you can swap out the woven or cushions for seating options that only exemplify the versatility of the Amari Collection even more. 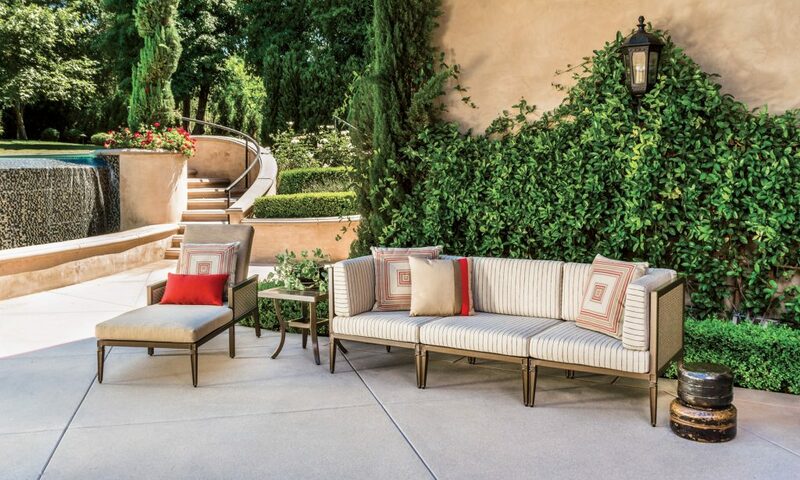 Elegant curves meet easy-to-clean patio furniture in the Cabrisa Collection. Looking at the sunset while dining will never feel better than when you set yourself in the Cabrisa Collection’s sling seating. This unique collection provides one of the most exquisite designs able to transition between many different styles with simple swaps of your favorite holiday or party themed accent pieces. Ideal for those who entertain outside, the Cabrisa Collection works to help you kick your feet up and really relax in your favorite outdoor environment: home. It’s true. There are some outdoor spaces that simply cannot handle the rare lines and modular shape of the Drake Collection. But don’t shy away! The Drake Collection is an elegant combination of deep seating, modular lounge, dining and balcony chairs that can take your outdoor space to the next level. 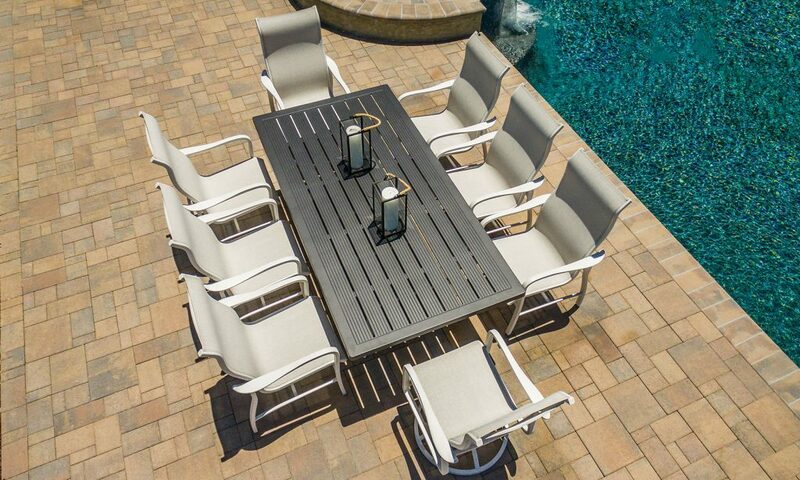 Designed with durable frames, harmonious proportions and timeless linear styling, the Drake Collection is not only an aesthetically pleasing option for patio furniture, it’s also one of the most functional and versatile options available. I’m telling you … this is the type of outdoor furniture that really fits any of your personal tastes but it’s ideal in larger outdoor space designs. With modern lines and an abundance of interchangeable fabrics, weaves and finish colors so you can always mix-and-match. 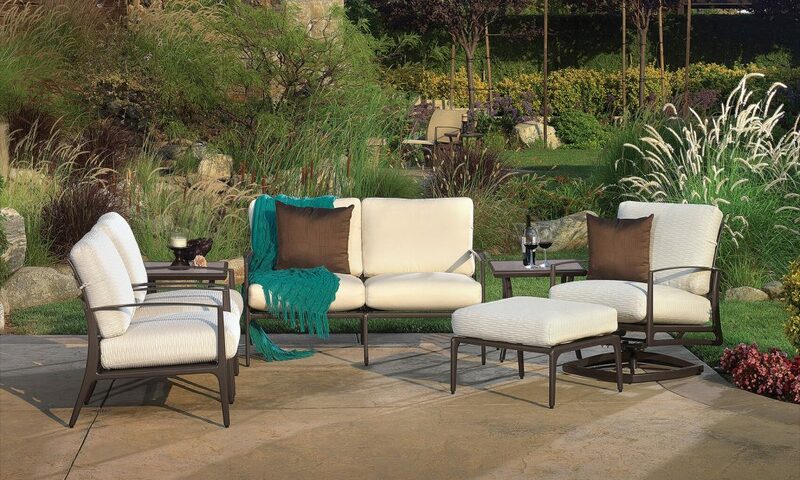 Take your backyard patio space into the Renaissance with the Florence Collection. This outdoor patio design can bring a new height of hospitality into your outdoor space with it’s luxurious yet strong curves. Entertain your guests in comfort and beauty with the inviting appeal of the Florence Collection. Let me tell you something, you can lean back with anyone and loaf in decadence in every piece of the Florence Collection. NOTE: You can keep different accent pieces inside your storage at home to easily switch up the outdoor style of your space. Just choose an outdoor patio set that works with your overall needs. Do I Need An Outdoor Living Space? Outdoor Living Concepts knows patio furniture. And even if you are new to the Desert, Outdoor Living Concepts can help you design a space that fits your needs as well as your needs for outdoor entertaining. Once you get together with the consultation team at Outdoor Living Concepts, you will know just the type of space you’ll be enjoying and what it will include. Essential for entertaining family and friends or just throwing holiday celebrations and neighborhood get-togethers, outdoor space can be expanded and designed in ways you may never have imagined! Let Outdoor Living Concepts help you dream up the outdoor patio you’ve always wanted and deserve. Are you ready to take on a transformational home design project? Tackling a re-design of your patio furniture is a simple, easy and cost-effective way to give your outdoor space an instant facelift. Call us today at (760) 772-1182 or request a design consultation online.